Welcome to Shoeful of Drool! Anyone wearing sandals or flip-flops while dishing out dog food knows exactly what inspired the name of this blog. That Pavlovian response of viscous, yet slick fluid runs like a faucet from all corners of a dog’s mouth. It is all sticky in your shoe and on your feet, but you can pull a hamstring or even do a split if you hydroplane across a puddle of drool on the floor. I have a dog named Dudley. He’s a golden retriever/German Shepherd mix with a little chow thrown in to color his tongue. He’s almost 14. I adopted Dudley from Independent Animal Rescue after Hurricane Floyd in 1999. The little felon was picked up for unknown reasons in Rocky Mount, NC September 15, 1999. This was the day before Hurricane Floyd came ashore and the Tar River, which runs through Rocky Mount, exceeded 500 year flood levels. Most of the animals at the animal jail perished in the coming days when Rocky Mount was underwater and no one could get to the facility to care for the animals. Dudley survived. The last 12.5 years have been a hoot. This is Dudley about a year ago. He had had his belly shaved for an ultrasound. The ultrasound showed some unpleasant things, but we don’t think about those. Dudley certainly doesn’t. So long as he has food, water and a walk every day, he’s one happy camper. There are still clear signs of the puppy he was in 1999 even though he has arthritis and is “selectively deaf.” He doesn’t hear the doorbell any longer and only reacts to the loudest claps of thunder, but he does whip his head around if I say something I’d rather he not hear. He tore his cranial cruciate ligament (blew out his knee) doing his happy dance because he was going for a walk. Because of his age, we don’t want to do surgery and he’s doing great so far. He stays pretty quiet in the house and his walks are never long enough in his mind. Dudley and his new orthopedic bed. Dog Food Recall Alert: The Associated Press has reported that 14 persons, including 3 from North Carolina, have become infected with salmonella linked to dog food. There are some high end brands and discount brands in this recall. Always wash your hands (and feet, if necessary) after handling dog food. This entry was posted in Uncategorized and tagged animals, dogs, health, nature, pets, travel, vacation. Bookmark the permalink. 16 Responses to Welcome to Shoeful of Drool! Thanks Janine. I have tons of stories and I plan on introducing Zoe the black & tan who lived with us for 10 years until she died last June. I hope to share my stores and maybe some tips from someone who probably learned them the hard way. Thanks Pat. I think it’ll be fun. Mandi: This is very sweet. Why should Dudley settle for an orthorpedic bed when he has yours? Duh! Really the only time Dudley would get on my bed is when he wanted a belly rub. 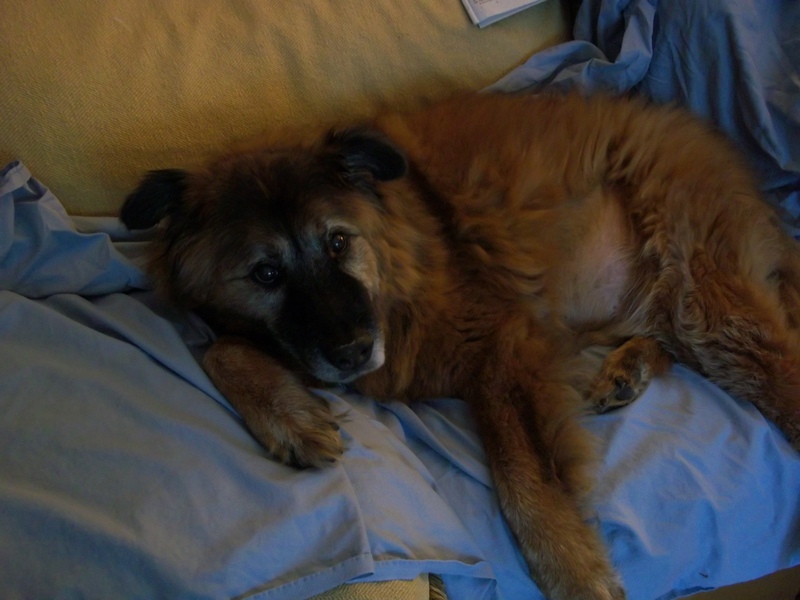 Zoe was the one who needed a queen sized bed (no matter whose house she was in). 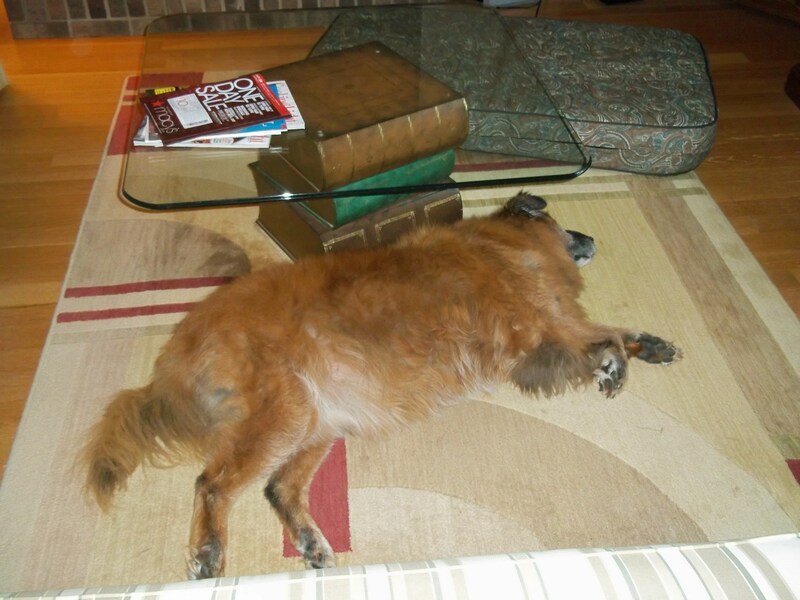 When I’m gone, Dudley very rarely goes to the bedroom, he usually stays in the living room or kitchen. He did get on his bed last night on his own for awhile. Progress! Sweet Dudley – great reminder to adopt your next pet! Adopted animals tend to be grateful and I got incredibly lucky with both of my dogs (once Zoe stopped eating furniture). Wonderful, Mandi! You know how much I love dogs and thank you for sharing your life with Dudley. I know you love dogs and I just learned about Ursula. The Wilton W***e was a wonderful creature and she had a good life with the Powell family. If Hunter would be interested in writing about Lexi, I’ll be happy to have a Guest Blogger from time to time. This is great mandi – really enoyed reading it and knowing that handsome boy of yours, i really got it! Great read Mandi, Dudley would be proud of his Mom! Thank you so much for stopping by. I will certainly check out your blog.